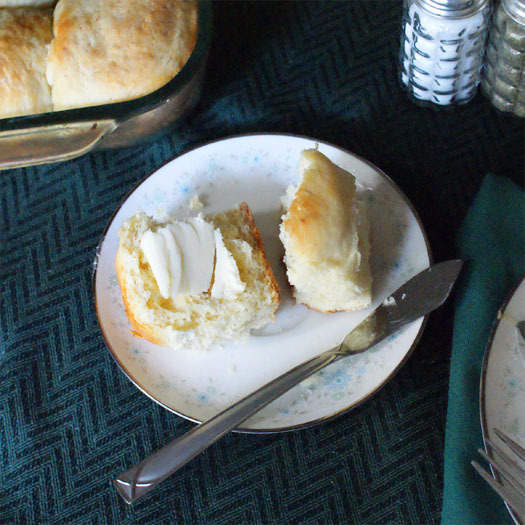 One-Hour Parmesan Dinner Rolls are perfectly seasoned, perfectly textured, perfectly beautiful dinner rolls that would make the perfect accompaniment to any dinner. My daughter has developed a love of bread and butter at dinner. And when I say love, I mean she expects there to be bread and butter at dinner every night. I think it's the grace that we say that gave her the impression that every meal should include bread. We always say grace at dinner. You know, the one that ends with "Give us Lord our daily bread." And we usually always have some kind of bread with our meal. This recipe was absolutely amazing. In just one short hour I was able to pull off perfectly seasoned, perfectly textured, perfectly beautiful dinner rolls that would make the perfect accompaniment to any dinner. And with 16 of them, there's enough to feed a crowd or to have some left over to serve with dinner all week! There's no reason NOT to try them! Warm the water, milk and olive oil to 120° in a small saucepan. Put 1 cup of flour and the yeast into your stand mixer bowl. Add the warmed liquids and combine with a paddle attachment at medium speed for 3 minutes. Add the egg and beat for 1 more minute. Add the garlic powder, salt, sugar and ½ cup of parmesan cheese. Then, add the flour a little at a time to the bowl with the mixer running. The mixture will form into a ball. If after adding all of the flour your dough is still too sticky, add additional flour 1 tbsp at a time until the dough is a soft tacky ball. If the dough is too stiff, add additional water ½ tbsp at a time. Switch to a dough hook attachment and mix for 5 minutes (or hand knead for 3-5 minutes). Turn the dough into a greased bowl (I use cold butter and rub it all over the inside of the bowl) and cover with a clean dish towel. Let rise in a warm place for 15 minutes. Meanwhile, punch down the dough with your fist (don't really "punch it", just deflate it with your hand). Using a sharp knife, divide the dough into four equal pieces. Divide each of the four pieces into four more pieces making a total of 16. Grease a 9 x 11 glass baking dish (with more cold butter). Shape the 16 pieces of dough into balls and line up side by side in the dish. Cover with the dish towel and let rise for 20 minutes. Preheat oven to 375°. Lightly brush the tops of the rolls with melted butter and sprinkle with additional parmesan, if desired.. Bake for 20-25 minutes until golden brown. Source: Adapted from One-Hour Pan Rolls Italiano from Red Star Yeast. Please refer to their website for bread machine or food processor preparation methods. Shared at 365 Days of Baking & More for Wicked Good Wednesdays. Truly enjoy reading the recipes and suggestions that you have on here. Thank you for sharing them!